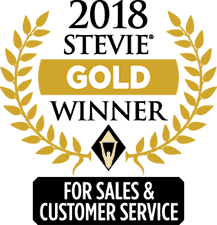 Boston, MA – March 5, 2018 – Pointillist today announced that it has won a Gold Stevie® Award for Best New Marketing Solution in the 12th annual Stevie Awards for Sales & Customer Service. More than 2,500 nominations from organizations of all sizes and in virtually every industry were evaluated in this year’s competition. Winners were determined by the average scores of more than 150 professionals worldwide in seven specialized judging committees. After winning the Gold Best In Biz Award for ‘Enterprise Product of the Year – Marketing Software’ 2017, the Stevie Award recognizes that Pointillist, a customer journey analytics platform, breaks new ground. By directly tying customer journeys to hard metrics like revenue, retention and growth, Pointillist makes marketing and customer experience (CX) investments measurable. Ron Rubbico, Pointillist CEO, said, “We are absolutely delighted to have won the Gold Stevie Award. This award is a great honor and recognizes the hard work put in by our team to create this disruptive product. Our growing number of customers are achieving real business impacts, including boosting customer acquisition, improving customer experience, reducing churn and maximizing marketing ROI.